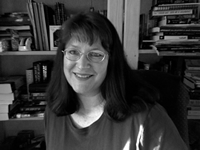 Besides fantasy, science fiction, romance mysteries, and paranormal romance, Holly Lisle also writes material for aspiring writers. Many are available for free downloading from her website. You’ll also find sample chapters of her books there. This story is about a slave, and her fight for freedom. She is a member of the Tonk race. Rather than a nation, the Tonk are spread throughout the world. It turns out that there are quite a few Tonk among not only Hawkspar's fellow slaves, but among the Oracles themselves. And one of them has cooked up a plot. 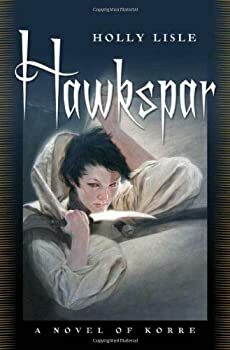 Once the slave — who, through most of the story, doesn't remember her name — takes on the Eyes, she becomes Hawkspar, and she immediately sets her predecessor's plans into motion. Then, she cooks up a few plans of her own. I love novels about oppressed people fighting for their freedom. And Hawkspar was as good as any I've ever read. Arhel — (1992-1995) Publisher: A simple shepherd girl discovers her wild mage powers after a murderous magician destroys her family. Now every mage in the world wants to train her. But Faia wants only to confront the madman who killed her loved ones. Devil’s Point — (1995-1997) With Walter Spence and Ted Nolan. Publisher: Turns out God has a wicked sense of humor… Nurse Dayne Kuttner puts her soul on the line to bargain with God for amnesty for Hell’s damned. But when God not only listens, but takes the deal she offers literally, her world turns upside-down. Plagued by pushy reporters, devilish doctors, desperate colleagues, bewildered friends, an imp named Earwax, and pursued by the Netherworld’s hottest guy, Dayne stands her ground… and pushes Heaven itself for an accounting of how love and Hell can coexist. Bard’s Tale — (1996-1998) The first two were co-authored with Aaron Allston. Publisher: When a peace treaty leads to shipwreck and disaster, the survivors, including the leaders of two mighty nations, advisors, ambassadors, sailors, and scribes, are forced to overcome the limits of state in order to survive. Candace Drake — (1997-2012) These are linked stand-alones. Publisher: Cadence Drake is a finder of lost things. Badger Bede is a technical wizard adept at creating programs that make Cady’s life easier. Both are handy with a stunner. All their talents are put to the test as they search for the Corrigan’s Blood, a new kind of TFN-drive spaceship with some very special abilities. At first it looks like their dream job — the job that will allow them to pay off their own ship, the Hope’s Reward, and to be more picky about the clients and work they accept — but they quickly learn that every dream has a price. Because behind the stolen ship lies the mystery of the people who stole it, people who appear to be using this insanely expensive vessel and others like it to smuggle inexpensive medicine to people who don’t need it. And behind that mystery is another… Why are all these people linked to Cady’s past and the one person who made it impossible for her to ever go home again? And why does everyone in the universe want Cady dead? The Secret Texts — (1998-2002) Vincalis the Agitator is a prequel to the original trilogy. Publisher: The Secret Texts trilogy is the story of the deadly fight of smaller and weaker opponents against the enormous forces that wield evil magic in the world of Matrin. Over the course of the three-book series, a magical war threatening the people of an entire world will challenge the ingenuity of our heroes. In DIPLOMACY OF WOLVES, we meet the ruling families of the country Ibera. They have always lived uneasily together, but recently matters have come to a head. Young Kait Galweigh has won the freedom to represent her family, the Galweighs, in its diplomatic missions throughout Ibera. But on her first mission, Kait uncovers a deadly plot by two of the other families to destroy the Galweighs and take over their holdings. However, Kait finds herself turning to matters far more world-threatening when she hears a mysterious voice urging her to travel to a far-off continent and retrieve the mysterious Mirror of Souls. Who — or what—is leading her so far from home? Who is following her in a ship with black sails? And most of all, what will the Mirror of Souls really accomplish, once she brings it back? World Gates — (2002-2004) Publisher: Lauren Dane discovers a doorway to another reality in Cat Creek, North Carolina — and she crosses over, driven by a strange compulsion she can neither resist nor comprehend. Molly McColl is brought there against her will — kidnapped from her trailer and carried into a realm that traps her, terrifies her… yet offers her a strange and wondrous escape. In an extraordinary universe of magic and monsters, two strangers sharing only pain and loss must now pursue the destiny that has united them. Because worlds are suddenly threatened by an evil beyond imagining — the world they have entered… and the one the have left behind. Moon & Sun — (2008-2009) This will be a trilogy. Publisher: Mankind is Sunkind, And rules by the light; Nightlings are Moonkind, And rule in the night; Or there will be war. Human and Nightlings are never to meet, but when Genna and her brother Dan venture into the old forest at night, they encounter a Nightling slave who reveals a terrifying secret: Genna and Dan’s village chieftain has made a dangerous deal with Letrin, ruler of the Nightlings, offering the lives of his people in exchange for his own immortality. To save the villagers and themselves, Genna and Dan strike their own bargain with the Nightling lord, but the stakes are even higher. Now, the siblings must embark upon a journey along the Moonroads, and bring back the key to Letrin’s downfall. Minerva Wakes — (1993) Publisher: He has a dragon singing in his bedroom. She’s stuck on the wrong side of an alternate universe. Their kids are kidnapped, both the good guys and the bad guys want them dead, and all of this started as somebody else’s mistake. For Minerva and Darryl Kiakra, nothing will ever be the same. Mall, Mayhem and Magic — (1995) With Chris Guin. Publisher: Learning of an imminent collision between the human and mythical worlds, bookseller Jim Franklin seeks assistance from a book of genuine spells, a group of larcenous elves, and a two-centuries-old virgin. Night Echoes — (2007) Publisher: Artist Emma Beck returns to her southern hometown to discover the truth about her secret family history. With the help of Mike Ruhl, the contractor she’s falling in love with, Emma finds that her legacy is more chilling and unexpected than she ever dreamed. Especially when she starts hearing the whispers late at night. CLICK HERE FOR MORE SPECULATIVE FICTION AND NONFICTION BY HOLLY LISLE. The Rose Sea — (1994) Publisher: A new quest fantasy in the spirit of Weis and Hickman by two of the most brilliant new stars of Fantasy and Science Fiction. In a world created and abandoned by the Great Ones, an obscure officer and a rancher’s daughter are brought together by war and thrown into battle against the insane demon-god of Tarin Tseld.